The visa office has some interesting office hours – 09h00-12h00 and 13h00-14h30. I stopped off at a local Walgreens to get my passport photo. After waiting in line and finally finding someone who knows how to issue passport photos, she takes my picture then wanders around the store for about 15 minutes before she comes back and says “Oh, damn, I forgot to tell you, we’re out of photo paper, you gotta go somewhere else.” Lovely. Luckily I work withing 2 blocks of three different Walgreens. The next one I visit had a big sign that said the photo printing service was out of order. Strike two. Head to the next Walgreens and stumble across a woman in her 60s getting her photo taken — 6 times. She didn’t like any of the photos and demanded the lady retake the picture. Good god, it is just a passport photo – deal with it. With photo in hand, along with my completed application and my airline reservations, I head to the Visa office the Tuesday before Christmas. I didn’t have hotel reservations as I am staying with MS and the room is in his name. The waiting area was quite full. When you enter you get a number (like from the deli) and you find a seat and wait to be called. After a short 15 minute wait it was my turn – 3 or 4 people were ahead of me. I bring all of my documents to the window and after the woman spends about 10 seconds looking through everything and denies my Visa. She said I needed a copy of the hotel reservation in my name. I explained I was sharing a room with someone who already had his Visa. She says I need to have him write a letter inviting me to China – but only if he’s Chinese, if he is not, I can’t visit. Change of plans. I leave and book a room (with no cancellation penalty of course) and try again. I return two days later with the same info as before, plus the hotel confirmation. I arrive at 08h45 and get in line again. This time, there are 2 people ahead of me and the line moves very fast. I hand my documents over to another woman. She pulls out my hotel and airline confirmations and throws them away. She then tells me that confirmations are not required and I don’t have to waste time providing this info. I did NOT tell her I was denied two days earlier because I wasn’t prepared. 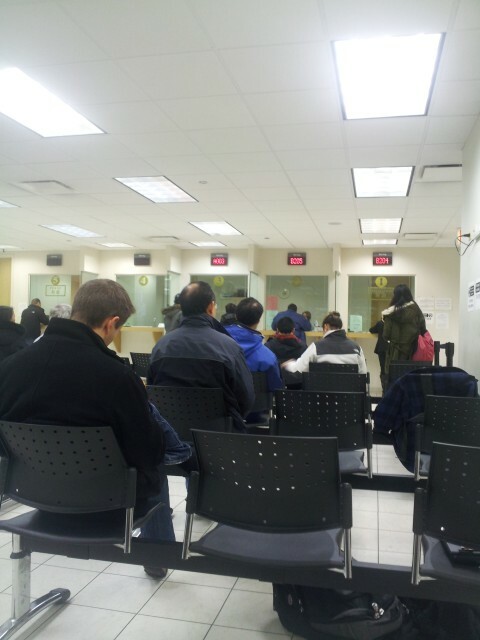 Oh bureaucracy. She then says “two”. I don’t understand. She continues to repeat the word “two” 5 or 6 more times. I continue to tell her I do not understand. She then hands me my receipt and tells me that my Visa will be available on January 2nd (TWO). Got it! On the second I arrived at 08h30 and was the first in line. I picked up my passport/visa, paid my bill and was out in just a couple of minutes. First roadblock was overcome relatively easily. Did you have any issues getting Visas for China? What was your most difficult part? Anything else I should be wary of? By Tim in Travel, Uncategorized on January 15, 2013 .